Low back pain is incredibly common, affecting upto 80% of Americans in their lifetime. This has created a 100-billion dollar per year industry focused on treating it. Yet despite advanced imaging technology, surgical techniques, and vast numbers of new drugs targeted at treating pain, inflammation, nerve irritability and more, the prevalence of low back pain has continued to rise. Below is an infographic summarizing some mind-blowing statistics about the cost, both financially and in terms of lives lost caused from back pain. Please include attribution to M4LPT.com with this graphic. Fortunately, a recent study has shown that physical therapy is equally effective and less risky than surgery for treating lumbar spinal stenosis, a common diagnosis for which people may choose to have back surgery. Additionally, the risks of using opioids include high misuse or abuse potential, negative side effects, and risk of death from overdose. 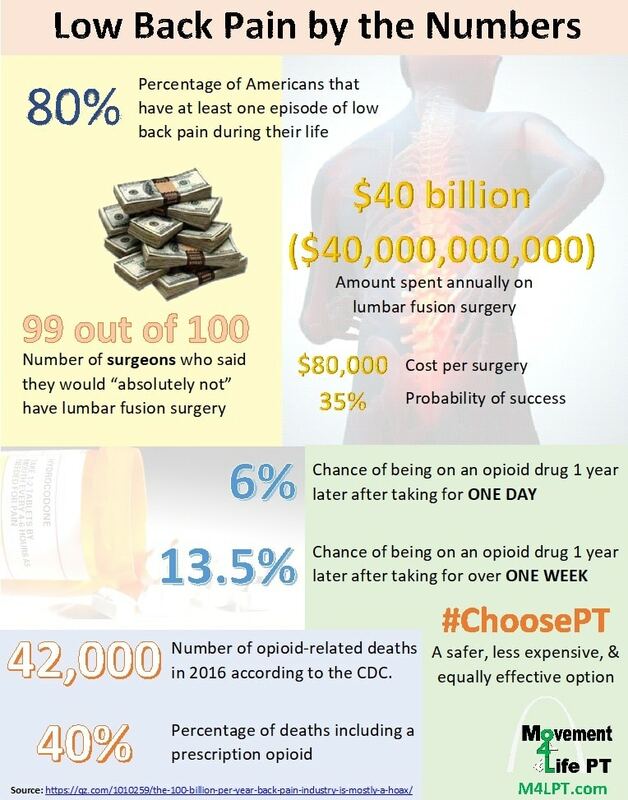 Thus the American Physical Therapy Association has started a campaign to #ChoosePT, a safer, less expensive, and equally effective option to treating low back pain and other chronic pain.